For the past several years Target stores have been offering up some fun new seasonal items for fans of pop culture as part of their seasonal resets and this year is no exception. As a part of this, Target has done a seasonal aisle of toys, food, ornaments and sometimes even exclusive figures. The toys that are part of this promotion are often of the under $10 “stocking stuffer” variety. They do this roll out of affordable holiday items four times a year for Valentine’s Day, Easter, Halloween and Christmas. Today we are going to look at Target’s 2013 holiday offerings. First up we will check out the ornaments. Of course they have the usual decorations of glass balls, icicles, animals and such, but it’s their licensed offerings that we are going to focus on in this article. This year Target has a selection of ornaments from Star Wars, TMNT, DC Comics, Marvel Comics, A Christmas Story, Disney, the Muppets and much more. Some are plastic/figural and some are blown glass. In addition to what we see above, this year Target also has a selection of ornaments produced by Hallmark. 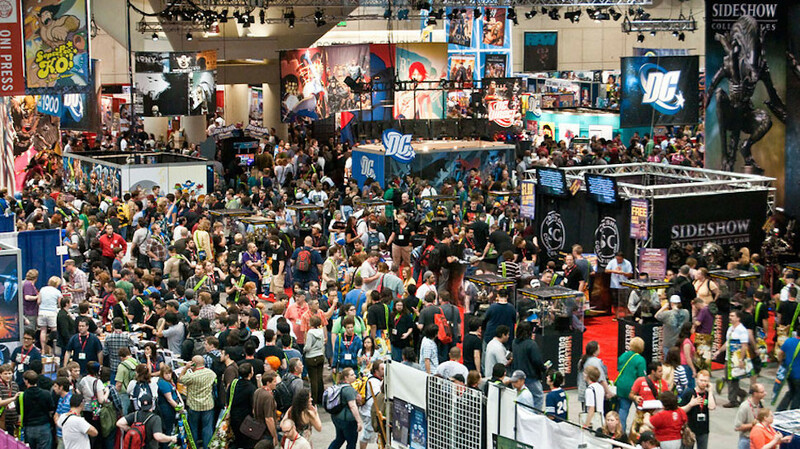 These offer some additional licensed offerings featuring characters from Star Wars, Marvel Comics, Iron Man 3, Batman the Animated Series, Justice League and more. These ornaments are also figural and blown glass. It’s interesting to see them reach back to the Bruce Timm designs for things like the animated Batman and Robin. I also love the stylized holiday R2 and 3PO set. For the “stocking stuffer” toys we have a pretty wide offering of licenses and items this year. Even though we’ve been told multiple times by Mattel that their Action League line is over, they have surprised us twice this year (Halloween and Christmas) with a re-release of their Batman figure with an exclusive deco for Targets holiday aisle. The Hexibugs get a holiday makeover with some red and green decos. There are a couple of small Lego sets of TMNT, “Friends” and a holiday train, but none of these Lego sets are exclusive to Target. If you like your characters round or super-deformed then you might want to pick up the TMNT Mashums or the DC Comics and Marvel Comics Big Inkies. In another aisle close by, there are the food related items such as Pez dispensers based on The Hobbit and some classics board games MADE OF CHOCOLATE! That’s just a smattering of what’s available. It’s well worth checking out next time you are in Target this month! 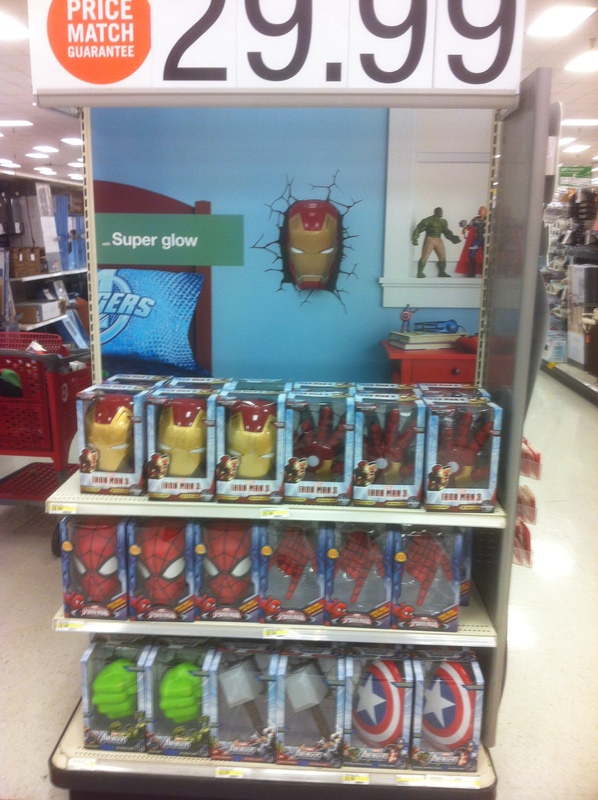 Something else cool – and then on my way out I spotted this endcap of some cool Marvel based “Super Glow” lights that look like Spider-Man and some or your favorite Avengers are crashing through and/or stuck in your walls. As you can see, Target has really embraced the nerd culture and continues to sell fun products to kids and collectors alike. Check out your local Target stores for these items and much more.